This villa is a unique secluded haven with breathtaking views from the rooftop, terrace & master bedroom. The sea is just a few steps from the house where you can swim in total privacy. As the name suggests, the house, location & views are truly idyllic. Can Idílico is a contemporary country house with an eclectic mix of modern and rustic. It has a homely boho vibe, and is the ideal retreat for a weeks getaway from it all. The house is well designed and equipped, with a simple yet stylish decor. There are no neighbours, just pure nature and great views: the perfect place to relax and enjoy the mediterrean at its best. Can Idílico has everything you would need for a truly relaxing holiday. The modern kitchen is easy to use and fully equipped with all the modern conveniences. The kitchen ajoins the spacious lounge with cosy seating, TV, DVD player & Italian Sky decoder. You will need to bring your own Sky card to use it. The house has two air conditioned bedrooms; 1 double bedroom and one with 4 single beds (2 x bunkbeds). There are two bathrooms and a fantastic terrace with magical views over the sea towards La Mola and Migjorn beach. The house also has the benefit of a washing machine and broadband internet access + wifi. This casa has a large sea view terrace which is just perfect for enjoying a morning yoga session, or meditation in total tranquility. The pine forest that surrounds the house affords total seclusion, which is great for a stroll through the garden scattered with aromatic wild herbs such as rosemary & thyme or you can indulge in a fresh morning swim before having breakfast al fresco. Located in Cami D’en Parra, on a beautiful setting right by the sea, about 3km away from the main road. It is just a short bike ride away from the nearest sandy beach of Mitjorn. The house is directly on the coast where you can enjoy private access to superb rocky ledges for a swim in the sea. You can hire a kayak, enjoy a refreshing drink or snack at a beach bar in Cala Saona, or fine dine in the restaurants overlooking the beach at Migjorn. 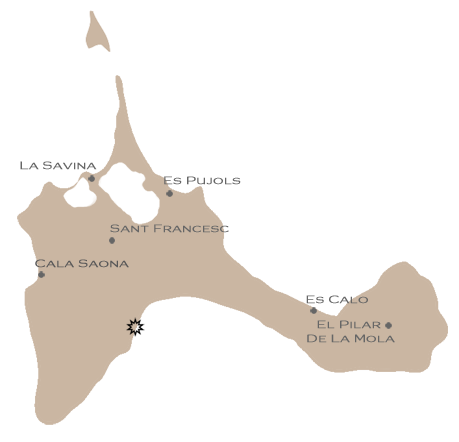 San Francesc is close by for all other amenities including banks, post office, shops & more restaurants.